I recently got tired of being cold at night sometimes when I was watching TV. I had been using an electric heater to warm my room, but it wasn’t enough. I needed more power. So I went out and bought this kerosene heater. It definitely did the trick warming up the room really quickly. These are the most common type of heater you’ll see in Japan. The lack of central heating means most houses will have a few of these (ours has four). They work pretty good, but there are a couple problems. The first is you can’t leave them on at night time or you’ll suffocate. The second is buying and putting kerosene into it is a pain. A couple good points for mine is that it starts so much quicker than the other ones we have, and it plays little song like “Twinkle Twinkle” and “Love Me Tender”, so obviously mine is the most awesome. If you live in Tokyo, most landlords wont let you have one of these in the building. It is often written into the lease contract. What do you use for heat then? reverse cycle airconditioner or electric heater. most new apartments will have the airconditioner built in. We have an air conditioner like that, but I find it’s a lot slower to heat up the room than the kerosene heater. Don’t worry they are really easy to use. It’s the gas stove that I don’t like. I had always used an electric one in Canada, so the woosh sound when you start it still makes me nervous. I have similar heater in my house. Could you tell me how to set timer for auto turn on? It will be very useful to pre-heat the room before we wake up. I’m not sure if you can do that. The timer on mine is only for auto turn off. I can set it for an hour or two then it shuts off on it’s own. It doesn’t have a clock built into it, so no auto wake up. Yours might, but I’ve never seen it before. Not much has changed in Japan as I can see. 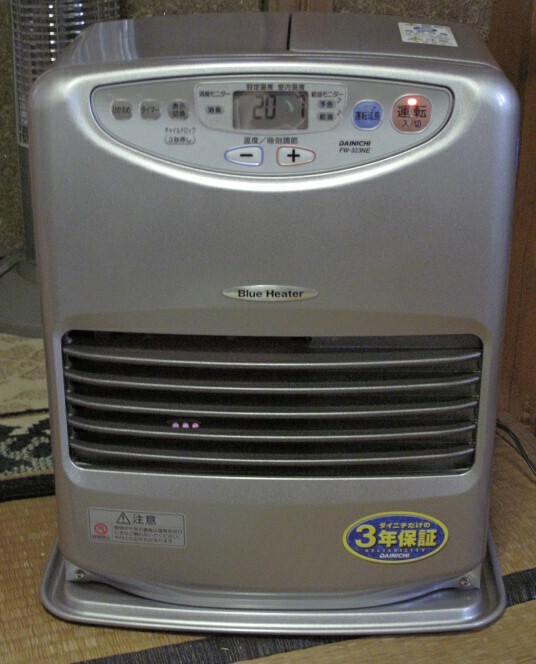 We used the same kerosene heater when I was there from 1992 to 1995 in our apartments in Saitama and Chiba Prefectures.